People often talk about the 4 P's of Marketing Mix: price, product, promotion, and place. 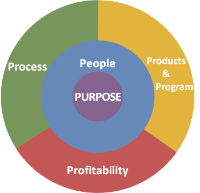 However, in the service industry, these 4 P's are expanded into 7 with the addition of people, process, and physical environment into the mix. A missional business is unique, however, in that it serves a different purpose. For this reason, an effective missional business adopts a basic 5 P Model with two additional Ps we can take into account. 1. It starts with the PURPOSE. What is a missional business for? What impact does a missional business aim to produce? It should be at the center of the missional business' model. This purpose should align with God's mission for humanity and redemptive purpose. Without correctly identifying the purpose, a missional business has a shaky foundation. 2. Once a missional business has established its purpose, it should focus on PEOPLE. People include colleagues at the missional business, suppliers, partners and customers. God is relational and works through people. A missional entrepreneur should also focus on people, building relationships and getting things done through people. The purpose of a missional business should trickle down at least to all staff to produce a significant impact. 3. A missional business then designs PRODUCTS OR PROGRAMS based on the foundation of the purpose aligned with God's mission. All products, programs or services should be redemptive in nature, bringing all things to reconciliation with the Creator God. 4. A missional business should put equal emphasis on PROCESS. This process represents all aspects of work, pursuing operational efficiency without compromising on effectiveness (impact) on people and the environment. Particularly in this informational age, the size of a missional business is not as important as one with optimized process. This process covers a desirable customer service quality as if working for the Lord and a desirable productivity with minimal waste. 5. An effective missional business should also focus on sustainable PROFITABILITY. A missional business should be profitable to sustain itself, but the nature of profitability should also be sustainable, not a one time profit. A missional business, however, should not pursue maximum profitability but optimal profitability. Any excess profit should be distributed appropriately to stakeholders, including the government, the staff, the customers and the community. In addition to these basic 5 P's, a missional entrepreneur should take into account two more P's: place and purse. 6. PLACE is the location where you operate your missional business. It is more than the geographical location. It also means the ethnic nations where the gospel of the Kingdom should be proclaimed, not necessarily through verbal communication but most likely through a godly life that mimics the sacrificial love that our Lord Jesus lived. 7. PURSE represents the level of resources that the Lord allots for you and your missional business. The amount or size of this purse is not important. What you do with whatever has been allotted to you matters. You are a steward of His resources and should strive to be a good steward who not only acknowledges His ownership and your stewardship (managership) but also uses them consciously according to the will of the Lord, the owner of the universe. It is our hope and vision that the Lord will increase the number of effective missional business entrepreneurs over time--one business at a time. It is only then that the business world, dubbed secular and corrupt, will be also be redeemed. Moreover, these missional businesses will be redemptive to the world, thus reconciling the world to the Lord--one person at a time. This materialization to transform the nature of how we do business all around the world will ultimately bring glory for HIS kingdom! SfK Ministries continues to lay its foundation for establishing a training program for missional business entrepreneurs. The first program is currently underway in Bangkok, Thailand since March 26 with training and workshops lead by Jeffrey Lee. Missional Business Management Training is now SfK MBA (Missional Business Academy) for its easy recognition and pronunciation. This training program will be held in different geographical locations throughout Asia and Africa, primarily to equip BAM practitioners with training on practical aspects of managing missional businesses. SfK is currently developing the first phase of a database management platform to gather information from missional businesses and Kingdom Fellows. We plan to share it at the SfK Ministries dedication service. Two additional phases will continue to be developed until the middle of 2017. SfK Ministries will be introduced and posted on www.businessasmission.com, a global BAM network and resource provider from this week. SfK Ministries is also developing a training program for Kingdom Fellows. April 11-12, 2016: Managing Missional Business Seminar lead by Jeffrey Lee in Chiang Mai, Thailand. Please pray that the seminar will build momentum in establishing SfK's ministry presence in northern Thailand and its neighboring countries. Throughout the month of April: Missional Business Management Training (MBMT) in Bangkok. The attendees will prepare their team business plans as if to seek an investment. Please pray that this simulation will allow the trainees to put their learning into practice well. May 3-10, 2016: Jeffrey Lee will visit Korea to make decisions regarding establishing SfK Korea which will function as a general partner to manage a BAM fund. Please pray that he will maintain his focus on the Lord who will go ahead of him in arranging for all meetings. 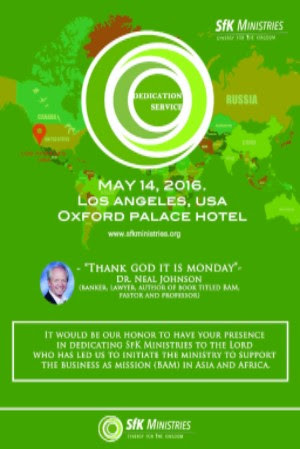 May 14, 2016: SfK Ministry Dedication Service in Los Angeles, California. SfK Ministries will dedicate the ministry to the Lord on May 14, 2016 in Los Angeles, California. It will mark the official launch of the ministry as well. Please pray that the dedication service will be held in a manner that will honor the Lord.